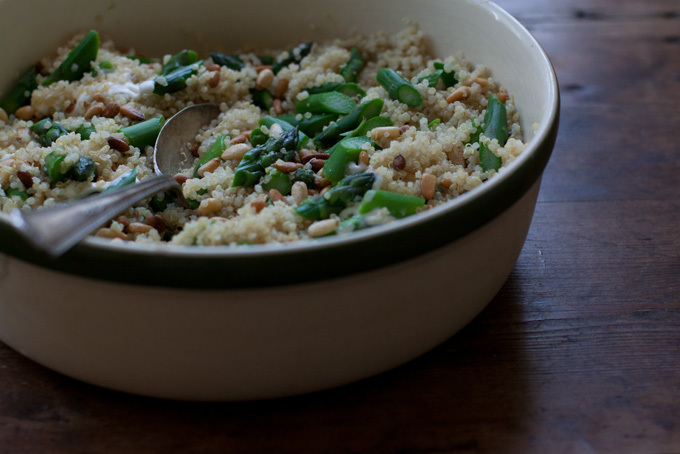 The Tabasco taste here is actually quite subtle once the butter is incorporated into the quinoa – a bit spicy, a bit tangy. You can make your butter stronger if you like, or serve the quinoa with more Tabasco sauce on the side. The next day I did a “fried rice” style version of this by making a thin omelette, slicing it up and stirring it back into a heated skillet of the asparagus/quinoa. If you don’t have pine nuts, sliced almonds might make a nice alternative. Start by making the Tabasco butter. In a food processor, or with a hand blender, whip the butter until it is light and airy. Add the mustard, Tabasco sauce, lemon juice and salt. As I mention above, you can make it stronger if you like, adding more hot sauce to taste. Boil the asparagus in a large pot of well salted water, for just for a minute or so – depending on the thickness of your asparagus. Drain. If you are serving this immediately you can leave the asparagus hot, but if you are going to wait to serve this, or think you’ll have leftovers I recommend you stop the cooking with cold water or a dunk in an ice bath, then drain well before using. Take the 4 cups / 20 oz / 565 g of hot cooked quinoa and toss with 3 tablespoons of the tabasco butter. You’ll have leftover butter – you can serve that on the side or use it for other purposes. Stir in the asparagus, pine nuts, and dollop with creme fraiche. Serve with more Tabasco sauce on the side. *To cook quinoa: Combine 2 cups of well-rinsed dried quinoa with 3 cups water and 1/2 teaspoon fine grain sea salt in a medium saucepan. Bring to a boil, cover, reduce heat and simmer for 25 – 30 minutes or until quinoa is tender and you can see the little quinoa curliques. Inspired by Skye Gyngell’s Asparagus with Tabasco Butter recipe in My Favorite Ingredients (Ten Speed Press, 2010).